State Department proposes more surveillance of social media, communications, and travel | Papers, Please! State Department proposes more surveillance of social media, communications, and travel – Papers, Please! The Department is revising the collection to add several additional questions for… visa applicants. One question lists multiple social media platforms and requires the applicant to provide any identifiers used by applicants for those platforms during the five years preceding the date of application. The platforms listed may be updated by the Department by adding or removing platforms…. Other questions seek five years of previously used telephone numbers, email addresses, and international travel. 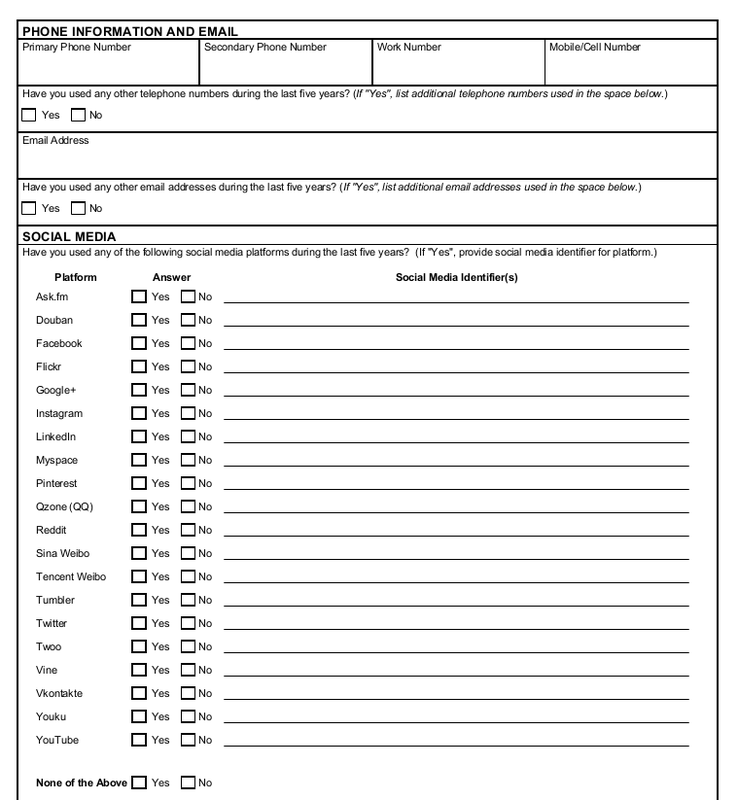 Questions about social media identifiers were added to the applications for visas and the ESTA form (electronic visa for citizens of countries in the US Visa Waiver Program) in 2016. But until now, the State Department has claimed that answering these questions was “voluntary”. This expanded social media, telephone, and e-mail surveillance has all the problems we and other organizations have previously objected to, and more. There has not previously been any requirement for would-be visitors or immigrants to the US to provide current or past telephone numbers, e-mail addresses, or a comprehensive list of which countries other than the US have been visited or when they have been visited. The State Department will use these identifiers and share them with other Federal agencies such as DHS, including through the National Vetting Center, to target surveillance of foreign citizens, to mine its historical archives of dragnet surveillance, and to decide whether or not to allow foreigners to enter or remain in the US. As part of “Visa Lifecyle Vetting” (formerly known as the “Extreme Vetting Initiative”) they will also be used for “continuous vetting”: ongoing suspicionless monitoring, profiling, and scoring by “pre-crime” algorithms purported to have robotic “pre-cognitive” abilities to predict future crimes based on what people say and who they associate with. People are likely to have used more telephones — phone in hotels, phones at friends’ homes, cellphones borrowed from friends and strangers, phone numbers of temporary SIM cards used while traveling — than they can remember. When you borrow a phone, you don’t always know what number you are calling from. And many people use unique “throwaway” e-mail addresses for specific purposes. Many visa applicants will not be able to provide a complete or accurate log of every phone number or e-mail address they have used in the last five years. Will these lead to denial of entry? Of course all of these questions are directly addressed to how individuals exercise their right to free speech and their right to assemble. While courts have often held that the First Amendment doesn’t apply, or applies only to a limited extent, to non-US citizens, we believe that these are human rights of all people, regardless of citizenship. And of course surveillance of social media, e-mail, and telephone communications will inevitably result in collection of information about US citizens who are friends (in the digital or physical worlds) or associates of, or communicate with, foreigners, violating the First and Fourth Amendment rights of those US citizens. No US law authorizes the government to maintain this information about US citizens or permanent residents, and the Privacy Act prohibits the maintenance of information about activities protected by the First Amendment without explicit statutory authorization. So the government will be required to expunge this information once someone obtains a green card (becomes a permanent resident) or is naturalized as a US citizen. There is no indication, however, that the State Department or DHS have any plans to do so. Comments on the State Department proposals can be submitted through the Web forms for immigrants and other visa applicants through May 29, 2018. You don’t have to be a US citizen or resident to submit comments, and you can submit comments anonymously. ← Is the DHS using this Unisys pre-crime software? Why doesn’t the State Dept, just hire Cambridge Analytica.